Sometimes when I hear that word, I cringe a little. 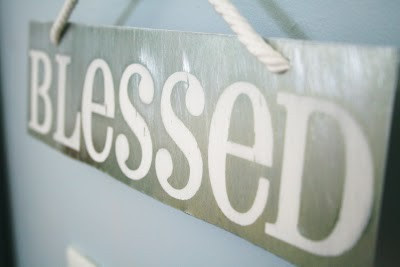 I know that I am blessed, but I often wonder if I live in my life in a way that radically demonstrates that I fully know just how blessed I am. It is one thing to be grateful and full of thanksgiving, but to fully understand how blessed you are allows you to then turn and be a blessing to others. Yesterday, I sat in the waiting room of my doctor's office. I did not feel blessed in the least. I could feel the aches and pains in my body that I was so desperately wanted to go away. As I sat there feeling sorry for myself, a lady using a walker struggled to the check-in counter and then sat in a chair near me. She smiled at me, and leaned over to say, "those are some kind of boots" as she pointed to my hot pink cowgirl boots. As I smiled back at her, she told me this was one of her favorite places. She went onto to tell me how it reminds her to celebrate life, to cherish every moment, and to be continually grateful. She pointed out that when most people glance around a waiting room, they see desperation and despair. She then made the bold statement to say that you have to choose to see hope. Its easy to look into a room full of germs and sickness, and have little faith. But that choosing hope means you are able to see that even when you can't understand something, you know that in the end it will all work out. She told me that she would never fully walk again. But that her life was not over in the least. As her name was called and she got up and started pushing her walker towards the nurse, she turned around and pointed to my boots again, and said, "make every step count." In that moment, I felt like she was whispering into my soul, "you are so blessed." It's amazing how God puts angels into our lives. I love those pink boots. I love your spirit of thanksgiving. I'm praying you feel better. XOXO. WoW!! Thats all I can say right now. WoW! !